If the target market of movie franchise robot-action-adventure from Hasbro, entitled the "Transformers" are the boys, young men, and boys at heart, the target market of the musical movie, "Jem and the Holograms", which is now showing exclusively on Ayala Cinemas (November 4, 2015), are the girls, young girls, little ladies, women fans of the old cartoon, and the girls at heart. This upgraded version of the 80's cartoon is really for the kids. Children, especially those little girls whose probably between 7 to 11 years old, who seek for someone to look up into or look forward to as their idol during their growing up years, will definitely find this live action musical adaptation enjoyable and entertaining as well. 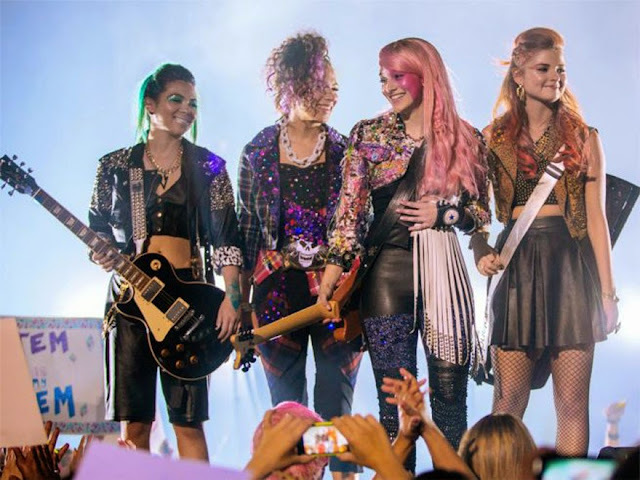 However, "Jem and the Holograms" is not for entertaining purposes only because it is also full of values and morals that parents will surely love. "Jem and the Holograms" has mysteries to be solved, love for parents and siblings, passion for music, and that attitude that everything's going to fall into their proper places at the right time. Jem is truly a modern icon that represent everyone who is unique and do something with a purpose. Now, whose parents do not want that to be watched by their children? Anyway, to be honest, I don't remember the whole story of the cartoon version, at all! Maybe that's just one of the reasons why I kinda enjoyed "Jem and the Holograms"! But just a warning though if you are going to watch this film, the story of the film is not too bad, but not too good also. Like I said, "Jem and the Holograms" is for the kids, and perhaps, for the kids at heart as well. Meanwhile, if this is just another one of Hasbro Productions' attempts to bring back the glory that was Hasbro during in the 80's, by slowly turning their old cartoons into live action movie series that every generation and not just the eighties' babies, will surely enjoy, then they might be on the right track of productions. However, I still believe that Hasbro Productions should look into their "Visionaries: Knight of the Magical Light" cartoon for a live action movie adaptation remake. This, I think will surely be a big hit! For the meantime, "Jem and the Holograms" is now showing, again exclusively on Ayala Cinemas! Catch Jem and her siblings battle their way to pursue their passion for music and dreams. And oh, do wait until the end credits! Overall, we give "Jem and the Holograms" an 8 out of 10 strictly for the kids' satisfaction. “Jem and the Holograms” Now Showing!